My head said "Yes" but my gut said "No". I knew it wouldn't be easy finding the Graffiti Pier in Port Richmond, that there'd be hiking involved and only one street to get us close to where we wanted to be. But Beach Street was impossible to find and the area was not what I expected. I expected some sand, maybe a boardwalk, possibly remnants of an amusement park and a low concrete structure covered with colorful marks made by street artists... all the makings of a pleasant outing. I hadn't realized we'd be searching for an abandoned spot along the Delaware River where ships once docked and carried coal, not an ocean or former resort. Instead we found a remote region surrounded by litter and broken glass, without a river or pier in sight... Beach Street... the start of our destination. But now I was hesitant about leaving the car... it parked and me from its protective metal exterior. I worried about being mugged, having our car (a rental) stolen or vandalized... jacked on all fours, its tires, battery and radio gone, with the words... "Welcome To Philadelphia" spray-painted in neon across the hood. An active mind perhaps, but also determined. With the car behind us and this ominous sign in front of us, we made our way past the gate, hoping to sidestep trash, puddles, predators and police waiting to arrest us for trespassing. Eventually we hit concrete... Coal Pier 18, the Graffiti Pier, in Port Richmond. And our rental car... exactly as we left it. For some harmless graffiti fun go here and here. I frequently wonder what history will say about the colorful, cultural artifacts that seem to shout and assault the senses. I wonder about the stories in the people's minds who contribute to the piers. Art? Decline? Destruction? Evolution of some purpose? Records of gestures? I commend you and hubby for your archeology through the inner-hinterlands of Philly. There was a documentary a number of years ago which tried to provide a framework for graffiti. A woman was speaking to her son who was going out with spray paint in hand. She questioned him as to his purpose. He replied that he would be noticed as a result of his graffiti. Her response was that he was a fool in his belief that this would bring some type of recognition. And yet there is something to be said for his idea of "being someone". Look at the interest it has created in this blog, it's lively pics, the risks other artist's are willing to take to view such an ehibition. btw: did someone wear cargo shorts or are they the abbreviated stories you saw along the river? Unlike you and many worldly people, I rarely think about history, and how today's actions will be perceived by others in the future. I suppose I should give it consideration, but the less time I spend thinking about the past or future, the less melancholy or anxious I feel in the present. I do however think a lot about mankind... what makes us tick, and the measures we go through to be accepted, acknowledged, and appreciated. Perhaps the same motivating reasons for someone with a spray can in their hand. 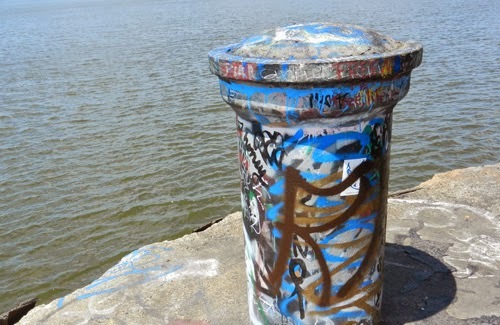 In the broadest of terms, the graffiti bombarding the pier in Port Richmond, though vandalism, is an art form. The question always becomes... is it good art or bad? Making no value judgment, what did impress me was the pier's vast physical structure and density of the graffiti marks applied to it. re: cargo shorts... a reference to the coal (cargo) once transported from the pier and the brevity of writing on this summer's blog.